Better Living Through Chemistry Back during the last century, when the technological revolution started sweeping the planet, one of the phrases enjoined by scientists, often under the purview of big corporations, was: “Better Living Through Chemistry.” Nowadays we know that many of the chemicals cooked up in scientific laboratories over the past decades are actually quite harmful and are not found anywhere in nature, making nature sorely pressed to deal with them. Unfortunately, we've infused just about everything we eat and use with harmful toxins. Berries are good for your skin, whether you eat them or mash them up and smooth them on your body. 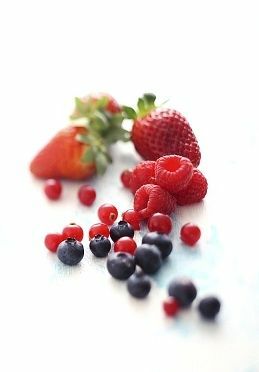 Four types of berries lend themselves well to epidermal scrubs. Fresh-frozen berries can work almost as well. The best are organic, grown with no fertilizers, herbicides, or insecticides. – Strawberries Salicylic acid in these berries can get rid of dead skin cells. They can help whiten skin and can be key to reducing dark circles under the eyes. They rejuvenate skin and eliminate free radicals that attack it. If you suffer from acne, broken capillaries, or splotchy skin, these berries will help. They normalize oil levels on your skin, making it healthier and less likely to accumulate sebum. Vitamin A, antioxidants, and phytochemicals help neutralize free radicals. Regenerative nutrients in these berries ensure that skin cells function to the best of their abilities by preventing premature death and fending off harmful invaders. They also defend against premature wrinkles. They work well for wind or sun damaged skin. You should use at least one of these four things in your berry scrubs. These are also the ingredients of which you should use the least. They can damage if overdone or if you scrub too hard. If you live near a soft-sand beach or a desert area, get a sieve and go sift out the softest, most dust-like sand. Once you've gathered it, wash it thoroughly. Chemically inert on your skin, sand is the purest medium for washing away dead skin. Never scrub too hard. Use granulated white sugar. Using a mortar and pestle, some folk use coarser or brownish sugar and mash it into a powder like fine sand. Sugar has a slightly anti-bacterial property, which is always helpful. Unlike sand, sugar will dissolve before you do any damage while scrubbing. Still, be careful. Use sea salt. It may be lumpy, so use a mortar and pestle to pound it into a fine powder. If you have oily skin, sea salt is great because it tends to dissolve oils and dry the skin a tad. Salt too will dissolve before you can do any real damage while scrubbing. Still, be careful. Iodized table salt is probably not the best to use in your home-made scrub (chemicals! ), but it will do in a pinch. If your skin is especially tender, you might want to try using oatmeal rather than the three previously mentioned. It's course enough to do a decent ex-foliation job, though it may not be strong enough to make you feel really clean and scrubbed. Once you have your berries mashed and your exfoliant agent ready, you're going to need a vehicle for the two, and there are of plenty of good things to consider. Usually, add water, milk, or fruit juice to thin the scrub, if necessary. Milk and its by-products have long been used in facial ointments. This has antibacterial agents and the stickiness helps pull impurities away from the skin. – Citrus Juice Berries are already rather astringent so go easy on citrus juices, though in combination with berries they can offer a very cleansing, blushing scrub. Steep the bags or the leaves for a long time. The thicker and darker the tea, the deeper its benefits. Adding mashed avocado or some olive oil will add deep moisturising qualities to your berry scrub. You won't need a degree, a lab coat, or a cabinet full of test tubes and beakers, just some kitchen counter space and a native sense of what works best for you. Basically, a facial scrub can be based on a five part recipe: Two parts mashed berries, two parts emollient mixer, and one part exfoliator. Mix them up using a spoon, an electric mixer, or a blender. Adjust amounts according to your skin sensitivity. Be especially cautious adding the exfoliator and lower the amount if you feel too much abrasion. Adjust thickness as necessary with the dilutions recommended above. Rinse your skin with copious amounts of warm water. Apply your scrub. You can use it immediately to cleanse your skin, or you can let it set up on your skin for ten or fifteen minutes and then gently scrub it off. Never scrub your skin too hard. Rinse thoroughly. Never use extremely hot water on any part of your skin. Concocting a decent home made berry scrub isn't rocket science, as you can see. Become your own best expert. Mix different kinds of berries. Increase or decrease the exfoliant according to your skin sensitivity or cleansing requirements. Consider adding other ingredients such as essential oils or different herbs and spices. For instance, lavender tends to sooth and peppermint can invigorate. Before you know it, your skin will become restored and brighter. As you refine your recipes, you may start passing them out to friends who need help, or as gifts, or maybe even end up selling them. No matter what you do, you'll be putting your best face forward. Put your best face forward with DIY Beauty Aids. About the Author: Joyce Del Rosario is part of the team behind Open Colleges, one of Australia’s leading providers of dietician and nutrition courses . When not working, Joyce blogs about health and fitness. Sugar or salt , a table spoon of extra virgin olive oil and a tea spoon of honey mix it together and your skin will be glowing.